A synagogue in Istanbul, Turkey. A Synagogue is a house of worship in the Jewish religion. The Jewish Sabbath is on Saturday, but observant Jews worship every day and many synagogues hold services every morning and evening. Synagogues often serve as a community center and have schools for religious and general instruction. The layout of a synagogue is somewhat similar to a church. There are rows of seats for the congregation and a raised area in the front from which services are typically led (some synagogues have the podium in the middle of the congregation). In the front there is an ark contains handwritten scrolls of the Torah, the first five books of the Bible. The scrolls are taken out and read from aloud during morning services on Saturday, Tuesday and Thursday and on Jewish holidays. While most synagogues have a Rabbi and a Cantor, services can be, and often are, led by lay adults. Men are expected to cover their heads when in a synagogue as a sign of respect. 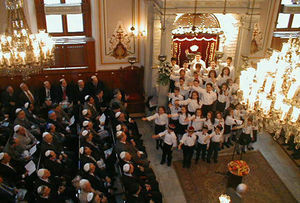 In Orthodox synagogues, men and women are seated separately. The first U.S. synagogue was build in in 1730 in the colony of New York. The oldest synagogue still existing in the U.S.. is the Touro Synagogue in Newport, Rhode Island that opened in 1763. During the colonial era the Jewish population grew to 2,000 and at least seven synagogues were built from New York to Savannah. In about 1830, 250,000 Jewish immigrants fled persecution in Bavaria to the United States, entering through Ellis Island. In 1881, a massive migration of 2 million began to flee pogroms in Russia to immigrate to the United States. There are currently about 3700 synagogues in the U.S. . There are synagogues in most major U.S. cities and in most other countries. Congregation Rodeph Sholom, New York. 3,727 synagogues in the United States! Synagogues of the World - The United States.